What on earth could possibly be tastier than crispy, crunchy, parmesan chips? 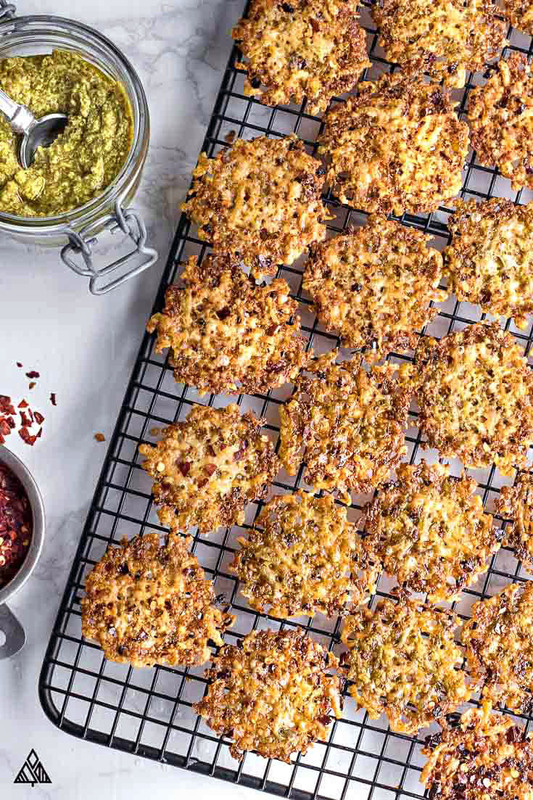 And this specific recipe for parmesan chips is the best because each of these bad boys are tossed in garlic-y pesto and sundried tomatoes, then baked into crunchy, bite-sized low carb chips — perfect for snacking on the go, crunchy meal toppings and appetizers! Whether you’re new to parmesan chips, or you’re a seasoned cheese chips veteran, you’re gonna love this recipe. So let’s get crispin’! This parmesan chips recipe is so easy and takes only 10 minutes to make — so when you’ve got a craving for that beloved crunch, bake a tray of these, and you’ll have no reason to give cheetos, doritos, or whatever carb-filled crisp a second thought. After one bite of these parmesan crisps, you’ll be hooked! And you’ll want to try every variation possible. Use this recipe as your crispy cheese base, then get creative. Here are a few ways to spice up your own parmesan chips creations. A slice of pepperoni on top — I do this in these no crust pizza bites! Check out the parmesan crisps nutrition below — if you’re sticking to low carb foods, the addition of sun dried tomatoes may add more carbs than you’d like. If that’s the case, leave ’em out! Of all the cheeses, I’ve found parmesan makes for the crispiest, crunchiest of keto cheese chips. It also happens to have the most protein in cheese, which makes me feel less guilty when I snack on it! You can use whatever cheese you fancy. Different cheeses crisp at different temperatures — play around to find the right temp for your cheese. Also note that not all cheese melting abilities are created equal! High moisture cheeses like cream and cottage won’t crisp as the cool. Great melting cheese include asiago, cheddar, jack and low moisture mozzarella. 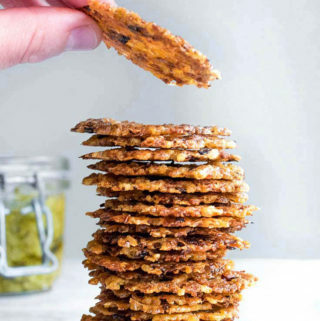 You can make your cheese crisps into whatever shape you desire — from triangular shaped low carb tortilla chips to small round mounds! Bake your cheese in a thin and even layer on a baking sheet. Once your parmesan chips have fully “crisped” in the oven, allow them to cool for a moment, then use a pizza cutter to cut triangles. I also made parmesan chips strips for my keto taco salad by cutting long and skinny strips in the cheese. * Check out the Epicurious review on pizza cutters, I bought the one without a handle and it changed my life! Form small mounds of cheese and evenly space them on a baking sheet. Keep the cheese in your mounds as even as possible, more cheese in the middle means your crisps won’t be as crispy. You can make your parmesan chips mounds as big/small as you’d like. Your parmesan chips will continue to crisp as they cool. Don’t keep them in the oven until they do, or you’ll be left with burnt, inedible parmesan chips! ** I get a lot of question about a parmesan crisps microwave recipe — I don’t have a microwave so haven’t tested these parmesan chips with that baking method. I’ve heard it works! Basic kitchen tools are all that’s required to make these low carb chips: a pizza cutter (if you’re going for the triangle shape), a baking sheet and parchment paper. I’d like to share one kitchen tool that makes my life a heckova lot easier — a silpat. It’s basically like a reusable piece of parchment! With all the low carb recipes I work up in the kitchen, I find myself using it all the time — and it’s the perfect tool for these parmesan chips. Check out what Cook’s Illustrated has to say about Silpats here. We usually store a bag of these in the fridge for quick and easy snacking — when there’s a convenient low carb snack around, I’m far less tempted by the carb-y stuff! Which helps me stick to my low carb meal plan and goal. I keep my cheese chips in the fridge. They stay nice and crisp when stored in an airtight container — I’d suggest a resealable bag. 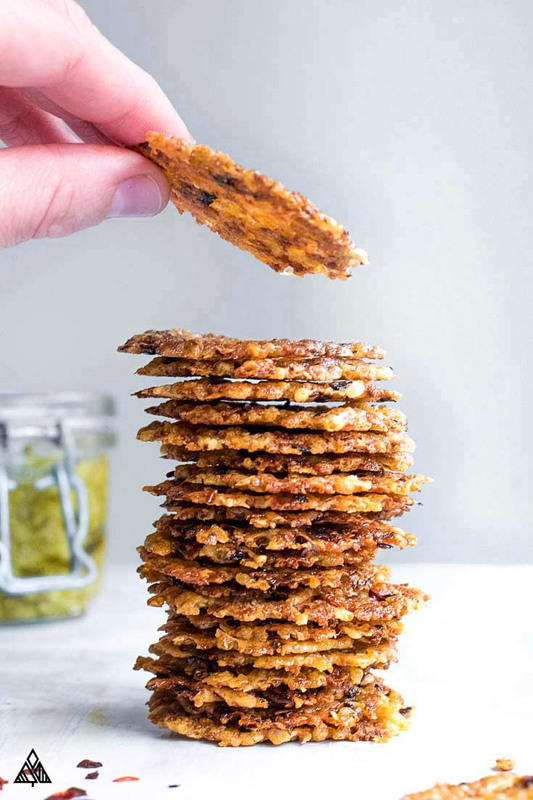 You can also stash these parmesan chips in the freezer for low carb snacks at the ready! 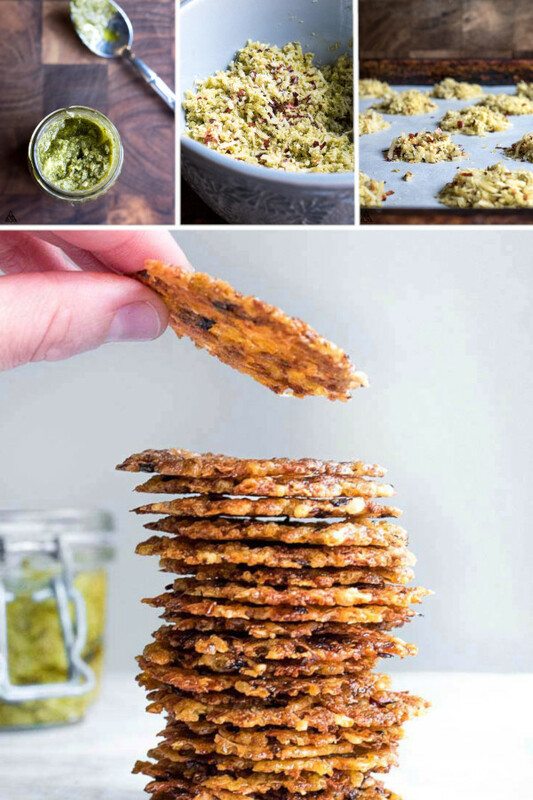 Can’t wait to hear what you all this about this variation of parmesan chips recipe! Let me know in the comments below how you enjoyed your parmesan chips, or if you tried any of the suggested variations. Happy crispin’! 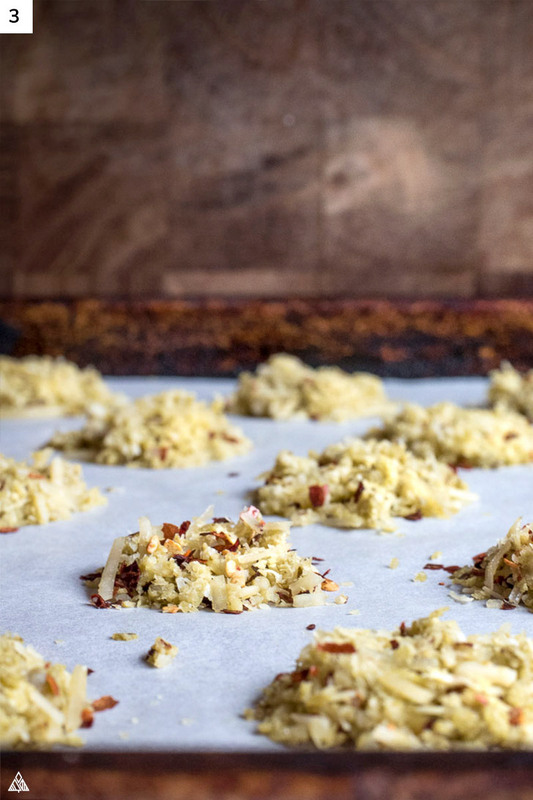 You don't have to be low carb or keto to LOVE this parmesan chips recipe! 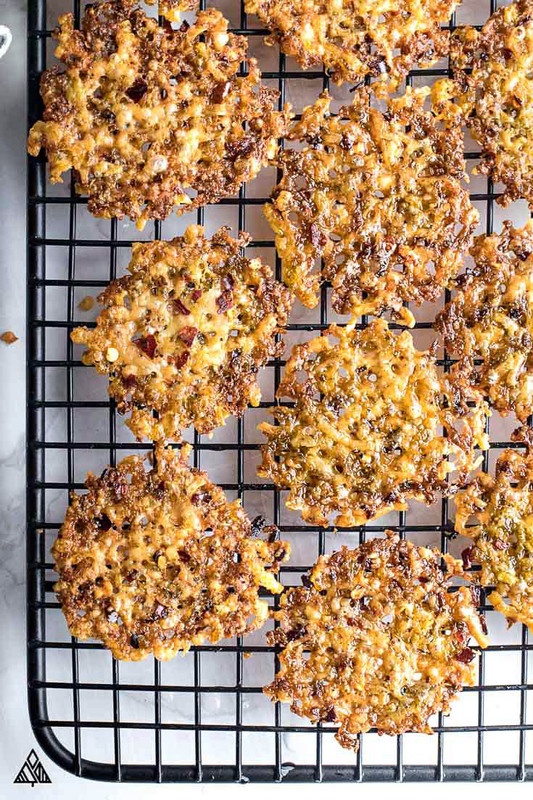 Crispy cheese baked with pesto and sun dried tomato — a protein packed snack perfected! Line baking sheet with a cut sheet of parchment paper (or Silpats). 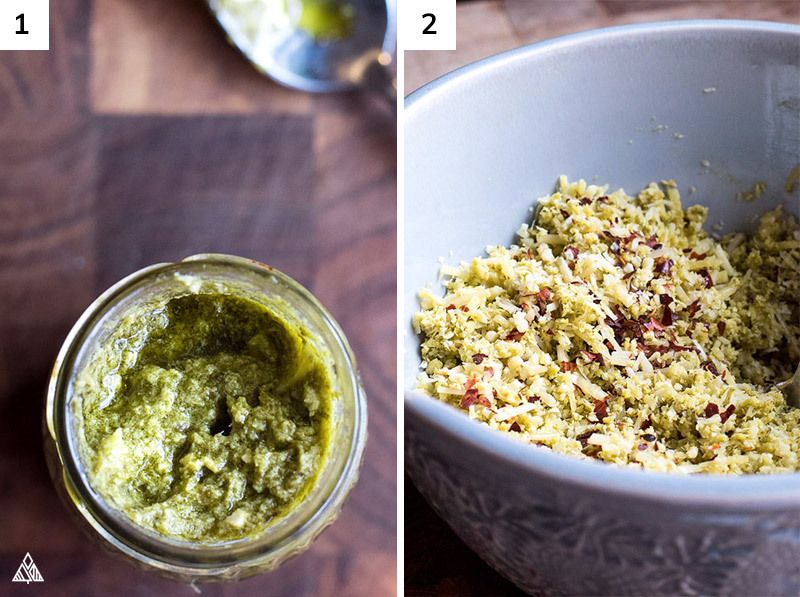 In a bowl, stir together parmesan cheese, pesto and sun dried tomatoes until combined. Place by spoonful onto the lined baking sheet. Mounds should be about 2 inches apart and slightly flattened on top. Bake for 5. Crisps will be done as soon as the edges are golden brown. If not done in 5 minutes, check every 2 minutes as they burn easily. Once cool, you can take them off the baking sheet. Enjoy! Serving size: the number of chips per serving will vary depending on how big/small you make your chips. I made 24 small chips, and enjoyed 2 chips for a serving. Save some carbs: by skipping the sun dried tomatoes. Can swap cheese, however different cheeses will crisp at different temperatures. For those who want their crisps and want them now, I’ve purchase the parmesan chips Costco sells and the parmesan crisps Walmart carries — both are delicious, but significantly more expensive. How many chips are in a serving? Depends on how large you make the crisps 🙂 I made 24 small crisps from this recipe, then had 2 crisps per serving. Hope you enjoy!! I made these last night and they were sooo amazing!